Despite the title, felines are the distinct individualists of the pet world. Each cat is his or her unique self, which is why we love them. 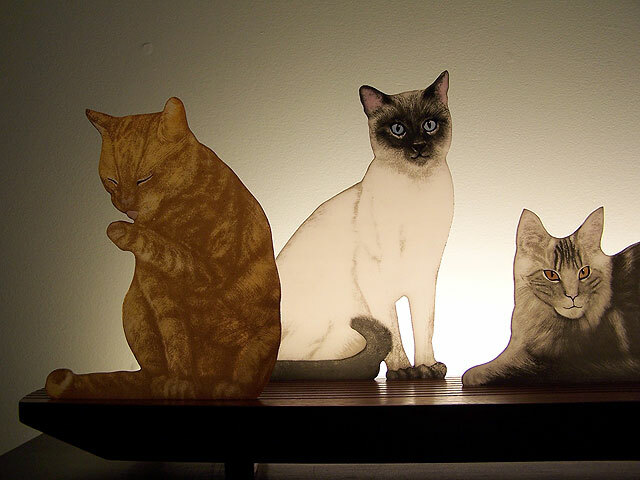 Using glass pigments and a technique called "reverse painting," Mere Cats offers four stunningly lifelike figures made entirely of glass paints fused onto glass. The sculpture is illuminated day or night by a light, recessed into the rear of the hardwood base, which is reflected off the wall behind. Available as seen or customized to your individual cats from your photographs.